Previously in Mattermark, we published a Beginner’s Guide to VC. What we neglected to include was a dictionary of jargon that insiders love to bandy about in Sand Hill Road offices. A quick note: Wherever we use a definition word-for-word from authoritative written sources, we cite it using standard parenthetical style. In other cases, we’re sure to provide links and other supporting information. Shares of a company that are not traded on a public market. Typically, in the United States, Private Equity investors are typically thought of as providers of capital to later stage companies. An organization set up to manage one or more venture capital funds. United States: An individual or institution who satisfies certain tests based on net worth or income as stipulated by the Investment Company Act of 1940. Rules defining “accredited investors” vary from country to country. Wikipedia has a good summary of these rules in various countries. It is best to consult a lawyer or a national private equity or venture capital association if you are uncertain about your accredited status. A list of these VC associations can be found here. Typically non-professional investors who provide capital to a startup company based on their close connection to a startup founder through familial, collegial, or professional relationships. Independently wealthy individuals who invest their own money into startup companies, usually as part of a broader investment strategy. So-called “Super Angels” meet the above definition but also possess exceptional insight, experience, and connections in the startup ecosystem. A program that aims to accelerate the growth of startup companies through mentorship, brokering connections, and providing services and infrastructure (such as office space) for small portions of equity in participating companies. Institutional investors who deploy capital into very early-stage startup companies. Seed investors are considered a subset of venture capitalists. Mark Suster explains the definition of a Seed vs. Series A round. Institutional investors who deploy capital into private, early-stage technology companies. Venture Capitalists are usually the next group of investors to commit capital after Seed Investors. Note: Technically, Venture Capitalists are a subset of private equity investors, but in common American usage, Venture Capitalists are considered separate from Private Equity. Private Equity Investors are institutional investors who deploy relatively large amounts of capital into later-stage technology companies to fuel expansion, finance M&A activity, or to tide the company over prior to their initial public offering. The NVCA has an entire research page devoted to CVC. CB Insights published a list of the 104 most active CVC funds back in early 2015. Note: There are many types of investors who can become limited partners in an investment vehicle. In general, they are all considered accredited investors. Below are examples of types of investors who might invest in a venture capital fund. A private advisory firm that typically manages the wealth, taxes, and estate planning of ultra-high net worth investors (i.e. individuals or families with more than $100 million in investable assets). A pooled investment fund run by an intermediary on behalf of a government or corporation for the purpose of providing pensions to employees. Typically, pension funds deploy their assets into venture capital as part of their risk capital investment strategy. Globally, long-term pension assets total some $35.4 trillion USD at the end of 2015—some 80% of annual global GDP. For more insights and information into the pension fund space, check out the 2016 Global Pension Assets Study from Willis Towers Watson. The long-term pool of financial assets held by many universities, hospitals, foundations and other nonprofit institutions. 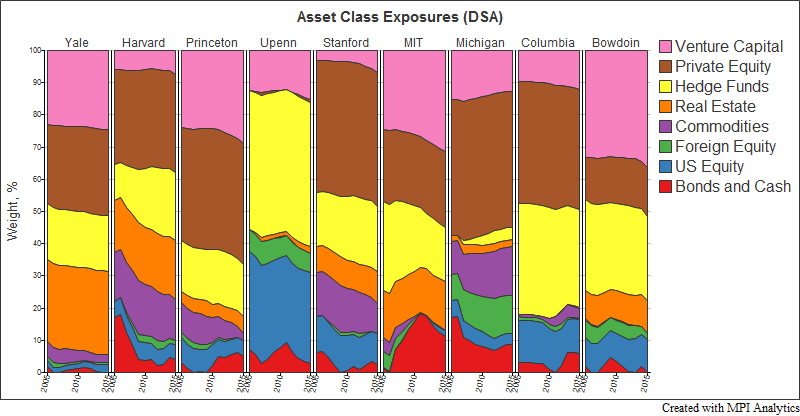 Markov Processes International published a report with a visualization of the relative share of different asset classes in several top university endowments. Notice how, in all cases (with the exception of UPenn), venture capital and private equity investments account for between 25% and 50% of most university endowments between 2005 and 2015. An investment vehicle that allocates its assets among a number of venture capital or private equity firms – rather than directly into private companies – on behalf of its investors. Note: Generally, Funds of Funds serve a similar set of limited partners as regular venture capital and private equity firms. However, different Funds of Funds’ portfolios are usually designed to serve the needs of each class of investors. For example, Common Fund was set up to pool and manage the assets from smaller college endowment funds. The most junior people at a venture capital firm, usually a recent college graduate. The primary role of analysts is to network and serve as the venture firm’s “boots on the ground” in an intelligence-gathering capacity. Analysts are also tasked with performing preliminary screening, business analysis, and market research. Ask Ivy had a great explanatory article on the most common roles within a VC firm. It’s referenced throughout this section. Associate roles are the next rung up on the hierarchy. These positions are typically “partner track” and open to applicants with graduate degrees or to analysts who’ve been working with the venture firm for a few years. Associates are usually tasked with due diligence research, obtaining progress reports from portfolio companies, and acting as the intermediary between investment prospects and the partners who make final investment decisions. Principals will typically sit on a few boards of the fund’s portfolio companies and will help scout out opportunities for these companies to be acquired. The Principal position is typically the next rung on the ladder to Partner status. “A Venture Partner is a person who a VC firm brings on board to help them do investments and manage them, but is not a full and permanent member of the partnership,” according to Fred Wilson. Venture Partners, unlike Entrepreneurs in Residence, will usually source multiple deals for the firm over the course of their tenure. Fred Wilson’s post about Venture Partners is very informative. Partners have a similar job description to Principals and Venture Partners. They also sit on the boards of portfolio companies and spend much of their time networking. However, partners are also tasked with more high-level duties, such as identifying emerging technology sectors in which the firm will invest, identifying and developing rapport with key players in those sectors, assessing and communicating fund performance to limited partners and, every five to seven years or so, raising another fund. Most venture capital funds raise a finite amount of money and operate for a finite period of time. Once the target fund size has been reached, that capital is under the fund’s management, usually for a period of ten years. Fund managers usually have the option to extend the fund’s term by two to three years, often in one year increments, at their discretion. The period in which the fund deploys the majority of its capital into its portfolio companies, which is typically somewhere between three and five years. The period in which the fund begins to see returns from its investments through mergers and acquisitions, initial public offerings, technology licensing agreements, and other means. A Youtube channel with a name we can’t say in polite company published a surprisingly entertaining, informative (and mercifully short) video explaining IRR. The shape of the Internal Rate of Return curve over the course of the fund’s lifecycle, encompassing both the investment period and the harvest period. Note: The J-Curve is so-called because it looks like a capital letter J, kind of. 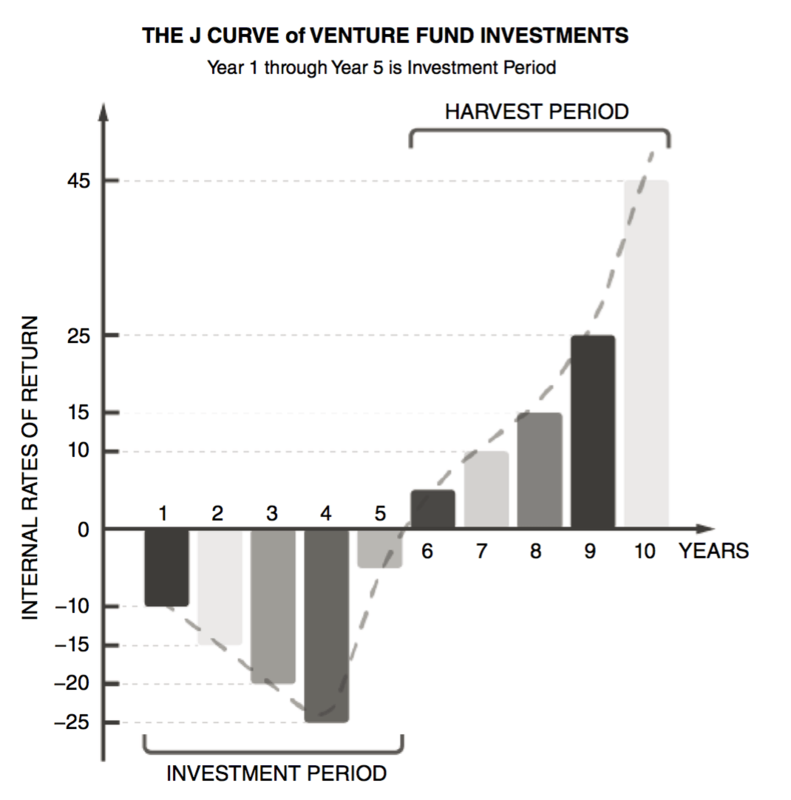 Capital Dynamics has a good report about the VC J Curve. Source: Ramsinghani, Mahendra. The Business of Venture Capital: Insights from Leading Practitioners on the Art of Raising a Fund, Deal Structuring, Value Creation, and Exit Strategies. Second edition. The Wiley Finance Series. Hoboken, New Jersey: Wiley, 2014. p 5. This is synonymous with the phrase, “Multiple on Invested Capital” or MOIC for short. Example: Let’s say an investor commits $10 million to a given portfolio company. For ease, let’s also assume she does not engage in any follow on investment. The portfolio company is acquired and the investor receives $50 million in proceeds from the acquisition, meaning that the Cash-on-Cash Return (or MOIC) of the investment was 500%. Macabacus published a good synopsis of the difference between Internal Rates of Return and Cash-on-Cash Returns. Macabacus also detailed the methods used for calculating each metric. The total market value of the financial assets which the venture capital fund manages on behalf of its limited partners. The annual fee the venture fund charges for its management services, typically 2% of assets under management, but there is some variation. Note: The management fee is used to pay base salaries, rent, legal and other service fees, marketing costs, and other incidental expenses the fund may incur over the course of its management. The origins of carried interest. The fee charged by the firm on the profits generated on a particular investment, typically 20%. This serves to align the interests of limited partners with the general partners managing the fund. There are some financial technicalities around carried interest that are a bit beyond the scope of this entry. There is a surprisingly good Wikipedia article on what’s known as the “Distribution Waterfall” that provides some insights into how/when/if carried interest is disbursed to general partners in a venture capital or private equity fund. CalPERS, one of California’s biggest pension funds, and a major investor in venture capital, published a handy slide deck with examples of carried interest calculations. For a more nitty-gritty look, investment firm Duane Morris also has a good deck explaining carried interest. ValueWalk published some interesting data from CalPERS’s private equity performance reporting website in a small study of carried interest and fund performance. A financing round is a type of securities offering wherein a company receives capital from investors in exchange for equity, as a loan, or in some other financial arrangement. The principal provider of capital in a given financing round, typically the same firm from round to round. The network of investors that are also participating in a given round. The valuation placed on a company prior to any additional investment in its current financing round. Bill Payne and the Angel Capital Association wrote a digest of various methods investors use to place a valuation on early stage startup companies. The process of investigating a business prior to making an investment, forming a business partnership, or other long-term binding agreement. The American Society of Mechanical Engineers shared a typical checklist investors might follow when undergoing due diligence research on a prospective portfolio company. An outline of the structure of a partnership or stock purchase agreement that is typically negotiated and agreed upon before more formal language is drafted in a final binding contract. A round in which the valuation of the company declines relative to the previous round. This might trigger anti-dilution provisions in the investment agreement. The financial mechanisms placed into a preferred stock agreement to maintain the investor’s percentage share in the company if the company raises a future round at a valuation lower than the one at which the preferred shareholder purchased the shares. Learn VC’s post about Liquidation Preferences is a good resource. A list of investors in a startup including the names of shareholders, number of shares held, percentage ownership, and which classes of stock are owned by whom. The option to buy shares of stock issued directly by the company at a certain price at some point in the future. A kind of financial instrument that, under certain conditions specified in the investment agreement, converts from a debt owed to the investor to equity in the company owned by the investor. Note: Convertible Notes are a common solution to the challenge of putting a valuation on the underlying company in the presence of tremendous uncertainty in very early-stage companies. That process of valuation is usually deferred to Series A investors. Once a valuation for the company is determined, the holder of the convertible note is granted the ability to convert the outstanding balance of the loan (i.e. the initial principal plus any interest accrued during the holding period) into equity in the company, proportional to the company’s valuation. Startuplawyer.com’s great guide to convertible notes that comes complete with a glossary of some of the legal terms involved. SeedInvest’s explanation of capped versus uncapped convertible notes. Manu Kumar of K9 Ventures published his Thoughts on Convertible Notes. Gust Equity Management made an interactive convertible note calculator. An abbreviation for “simple agreement for future equity,” this financial instrument closely resembles a convertible note, except they are not a debt instrument. Y Combinator was the first to implement the SAFE note and has an explanation on their site. They also have sample SAFE agreements and a very detailed “SAFE Primer” that maps out multiple investment scenarios for SAFE holders. Brad Feld and Jason Mendelson, Venture Deals: Be Smarter than Your Lawyer and Venture Capitalist, 2nd ed (Hoboken, N.J: Wiley, 2013). James M. Kocis, ed., Inside Private Equity: The Professional Investor’s Handbook, Wiley Finance Series (Hoboken, N.J: Wiley, 2009). Joshua Lerner, Ann Leamon, and G. Felda Hardymon, Venture Capital, Private Equity, and the Financing of Entrepreneurship: The Power of Active Investing (Hoboken, NJ: John Wiley & Sons, 2012). Mahendra Ramsinghani, The Business of Venture Capital: Insights from Leading Practitioners on the Art of Raising a Fund, Deal Structuring, Value Creation, and Exit Strategies, Second edition, The Wiley Finance Series (Hoboken, New Jersey: Wiley, 2014).